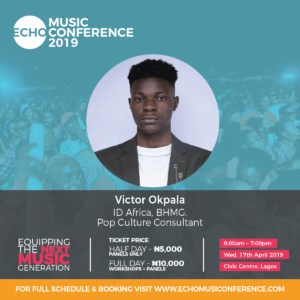 The organisers of ECHO Music Conference have announced that Nigerian music commentator and pop culture consultant at ID Africa, Victor Okpala will serve as a moderator at the maiden edition of the non-profit music development event which takes place on Wednesday, April 17, at the Civic Centre, Victoria Island, Lagos. The one day conference themed “Equipping The Next Music Generation” is the brainchild of The Echo Foundation in conjunction with West Africa’s largest music festival, Gidifest. It is part of the Lagos Music Week and will henceforth become an annual celebration of the very best of music and lifestyle the city has to offer. 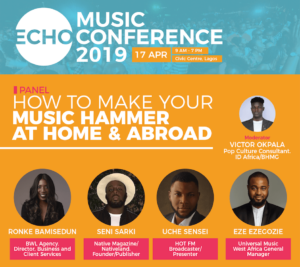 Victor will be moderating a session on ‘How To Make Your Music Hammer Home And Abroad’ with a robust line-up of panelists including Eze Ezegozie, GM Universal Music West Africa, HOT FM Presenter Sensei Uche, Ronke Bamisedun who is the founder of BWL Agency and Sani Sarki who is the Publisher of Native Magazine. As a seasoned pop culture commentator, Victor Okpala has held deep and insightful interviews with some of Nigeria’s biggest music superstars including, M.I Abaga, Seyi Shay and Cobhams. He was the music editor at TheNETng before the entertainment news platform’s acquisition by ID Africa in February 2019.